Visions of being snowed in, carving sweet turns with your sweetie. It’s that time of year to plan a snow lovers getaway. I firmly believe Vermont has the most romantic ski spots. Picture small towns with towering church steeples, covered bridges, charming inns and posh lodging properties, snow covered peaks and surrounding scenic valleys. Now – where to go depends upon your ski style, and more importantly, that of your very special ski buddy. If you are core skiers-the first chair, serious fall line type – then Stowe is still and will always be “The Ski Capital of the East.” The only thing more challenging than Stowe’s Front Four terrain, would be finding a more postcard-perfect town than Stowe village in the heart of winter. Stay at the Stowe Mountain Lodge for the ultimate, slopeside, posh, with a spa. But if you wish to stay closer to town, reserve an Inn room at Field Guide – a Lark Hotel, centered between the ski slopes and all the tempting boutiques and restaurants of downtown Stowe. You’ll want to divvy your time with your true love between both. Exploring the happening après ski spots and shops along the Mountain Road is a great way to cap off your day on Mt. Mansfield. 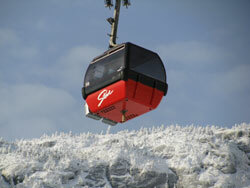 Stowe notes: The Quad opens at 7:30 on weekends so be there (I told you Stowe is for serious skiers), then reserve a table for two with a view at the Cliff House atop the gondola for a memorable midday meal. If you aren’t quite so venerable about your vertical stats– a beautiful bed and breakfast amid 245-acres in the Mad River Valley might make you fall madly in love. 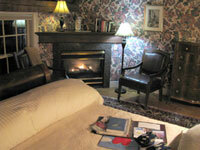 If you wish to stay on mountain, Sugarbush’s Clay Brook Inn is the place. But for a true Vermont country Inn experience, The Inn at Round Barn Farm is a wedding spot and honeymoon haven (or anniversary, birthday, any excuse will do) for couples.As the innkeeper says, “We make romantic heroes out of men every day.” You may find yourself in your fluffy robe and slippers lounging over fluffy cheddar quiche and savory maple sausage, instead of skiing first tracks because the food here is deliciously homemade and the hospitality is endless. Skiing at nearby Sugarbush or Mad River Glen is an alpine amenity, so is touring the Vermont villages of Waitsfield and Warren. 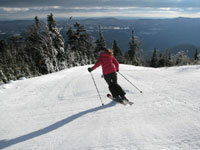 Sugarbush has two separate ski areas, Lincoln Peak and Mount Ellen, to make turns on. The Vermont views from both summits are awe-insuring (or perfect for a proposal if that’s a ring in you pocket). When you ski Sugarbush with your sugarpie honeybunch, be sure to have lunch at Timbers, the new roundhouse restaurant at Lincoln Peak. Sit down table service with a view of the slopes should have her falling for you…timber. 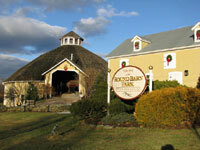 Apres ski, returning back to the Round Barn Farm , you will find a plate of freshly baked cookies and a roaring fire. Of note, the 1910 Round Barn next to the Inn is a popular spot for weddings, countless of couples have said “I do” in this authentic cow barn. The doting staff at the Inn love to help stage proposals in the snow too. Certain nights you can snowshoe to a four-course candlelit dinner in a remote cabin. Get this – your guide is Cooper the lovable black lab.